Perhaps one of the most shocking developments of the extramarital affair scandal that brought down CIA director and former Army four-star David Petraeus last November was the revelation that Marine Gen. John Allen, commander of U.S. allied forces in Afghanistan, was also under investigation for allegedly sending inappropriate emails to Tampa socialite Jill Kelley. After an exhaustive review of Allen’s email correspondence, he was cleared of any wrongdoing in January. But the damage had already been done to the reputation of the clean-cut general. He turned down the post of supreme allied commander at NATO earlier this month in favor of retirement at age 59, announcing that he was stepping down to take care of his wife Kathy, who suffers from an autoimmune disorder. Many theorized that his decision had much to do with a desire to put the scandal behind him and move on. 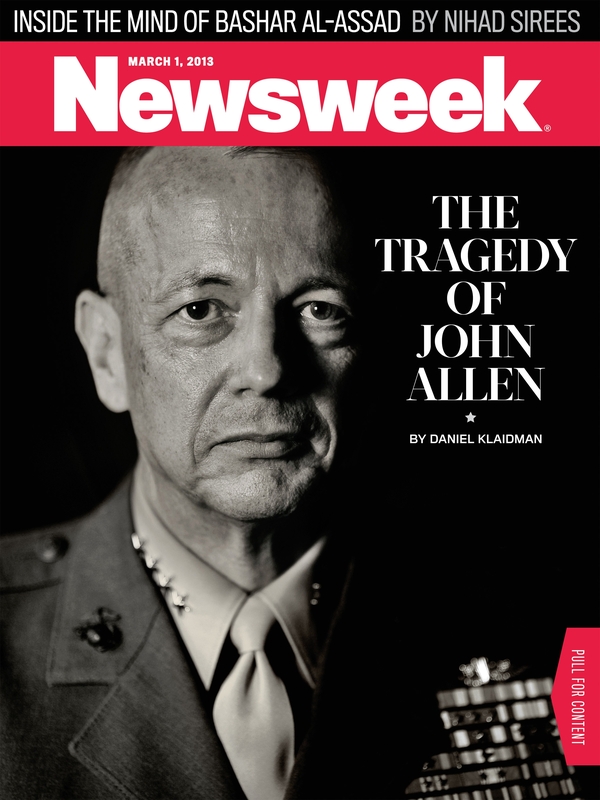 This week Newsweek profiles Allen in its cover story, bemoaning the fact that a brave fighter and tireless leader would end his career in such ignominy. With a scholarly bent, Allen collected numerous postgraduate degrees and ended up teaching at the Naval Academy. It was there that people began noticing his extraordinary drive and perfectionism. After working late into the night, it was not uncommon for Allen to slip into a flight suit and sleep in his cramped academic office. Sometimes he could be found at dawn standing alone in a cavernous auditorium reciting word for word an upcoming lecture, his voice echoing through the darkened hallways. “It was a full dress rehearsal,” recalls Stephen Wrage, a civilian member of the faculty who has known Allen for years. His punctiliousness was legendary. When the Naval Academy put on its annual five-day conference on international relations, Allen wrote a 48-page operational order, or OPORD, choreographing the event down to the most minute details. When he took over in Afghanistan in 2011, Klaidman writes, he balanced the grueling pace of managing a war with the daily emotional burden of seeing American troops die. Allen maintained a ferocious pace in Afghanistan. “It was the speed of a wind sprint but the distance of a marathon,” says the political adviser (Marc) Chretien, who was with him the whole time. Typically, Allen got three to four hours of sleep a day. There was no time off other than three hours on Friday mornings when officers paid their bills online and did their laundry. Throughout the day he responded to a flood of emails from the Pentagon, the White House, and NATO headquarters in Brussels, all while receiving a constant stream of visitors, including heads of state, chiefs of coalition military missions, American politicians, and Afghan dignitaries. And because it was war, much of Allen’s psychic and emotional energy was drained by the deaths and horrible injuries of the combatants who served under him. There were weeks when he attended as many as three or four “ramp ceremonies,” honoring fallen soldiers as their caskets were being loaded onto the back of a military plane for their final journey. Marine Corps Times writers Dan Lamothe and Gina Cavallaro profiled Allen in May 2011 as he replaced Petraeus in the Afghanistan top post. Even before Allen proved his mettle directing some of the final phases of a complex and dragging war, his supporters ranged from White House officials to platoon commanders who had served with him. 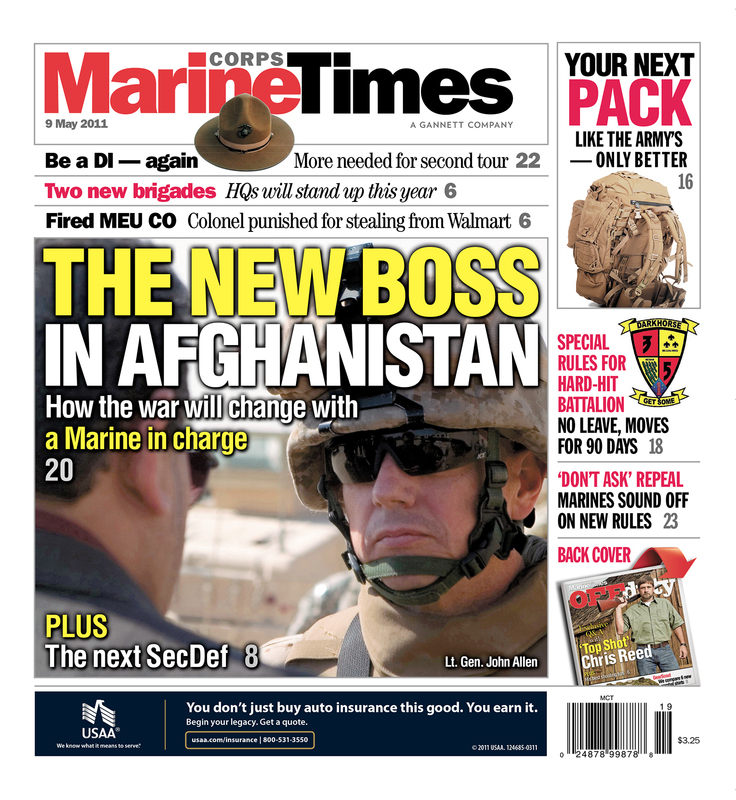 Marine Corps Times wrote a cover story about Gen. Allen in May 2011, when he was tapped to take over as the head ISAF. An interesting coincidence, that issue also profiled the new Defense Secretary, Leon Panetta, whose successor, former Sen. Chuck Hagel, started work at the Pentagon this week. Lt. Col. Tim Parker, who worked under Allen in Iraq in 2007, said Allen had the gift of intuition and listening and communicating with the rank-and-file Marines he commanded. If eyewitness testimony is any indication, Allen was a Marine’s Marine from his academy days up through to the moment he left the service to care for his wife. It’s hard to say what was in those emails between him and Kelley, the socialite, that caused him to be subjected to such scrutiny. Klaidman writes that a source described them as “flirty but unconsummated,” even though Allen said he had taken care not even to be alone with Kelley to avoid impropriety or its appearance. In any case, the Newsweek story raises a pressing question: are we expecting too much from our general officers? Are the standards we subject them to simply too high? It’s worth noting, as Klaidman does, that one of the senators who would have had to approve Allen’s nomination to the NATO post is Sen. David Vitter, R-La., who kept his seat despite admitting to using the prostitution services of the “D.C. Madame” in 2007. If (Allen’s) track record in Afghanistan, in Iraq, and at the Naval Academy is any guide, he would probably have performed admirably in the role of Supreme Allied Commander Europe as well. Instead, his private emails became a public obsession. And now America has one less general willing to go on bearing the extraordinary burdens of war.